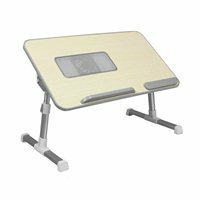 Alurateks Adjustable Ergonomic Laptop Cooling Table with Fan is a great solution to cool your laptop while providing a comfortable customizable working surface. Extend the life and functionality of your laptop by providing a constant even flow of cool air to keep your system from overheating. The cooling table supports MacBook Pro, MacBook Air, Chromebook, Ultrabook, netbooks and all laptops up to 17 inches as well as tablets and smartphones. Connect the cooling table to your laptop with the attached USB cable. The Adjustable Ergonomic Cooling Table is USB bus powered with low power consumption so no need for an external power adapter. The USB cable tucks neatly underneath the table for easy portability. The portable cooling table is designed to be slim and lightweight while keeping its durability. The surface features tilt control and adjustable height with auto locking legs so you can create an ergonomic work station whether youre at home, school, or work. Compatible with all notebooks up to 17"